This delicious easy tomato soup recipe only takes 20 minutes to make and 6 simple ingredients. It’s full of flavor, creamy and is vegetarian, vegan and gluten free. This is my quick-and-easy healthier version of canned tomato soup. Canned cream of tomato soup is popular, but rather processed. It’s simple to make your own at home, and you can control the salt and sugar levels. This soup is full of tomato flavour. It’s creamy, thick, and delicious. Plus, it’s ready in just 20 minutes! I’ve used fresh tomatoes (look for lovely dark red ones, ideally on the vine, for the most flavour). However, out of season you could substitute fresh tomatoes for two cans of chopped or plum tomatoes. 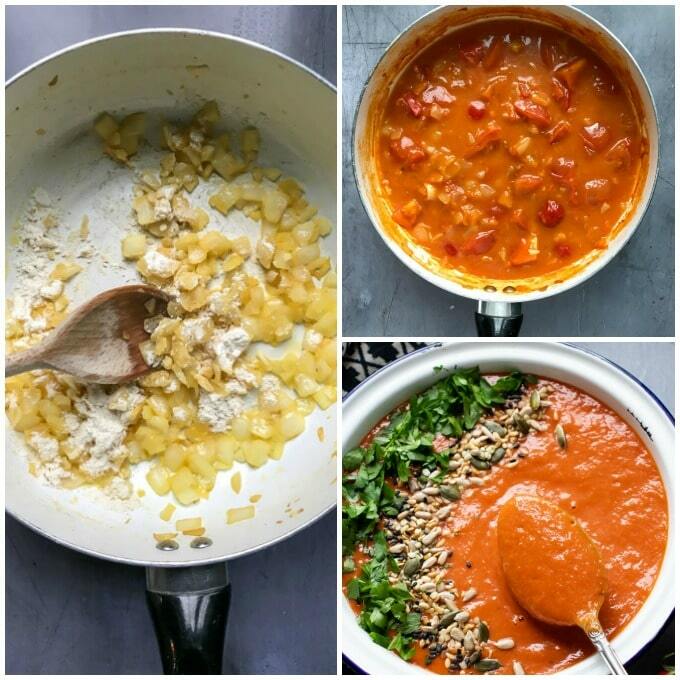 If desired, sieve the tomato soup over a large bowl for a smoother finish. 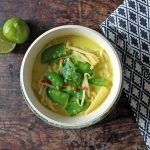 I’ve said it often on this blog, but I am a massive fan of soup. I eat soup nearly every day for lunch and I’m constantly whipping up big batches of various flavours to fill my freezer. I’ve been known (often!) 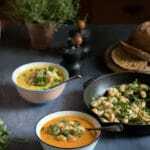 to have soup for breakfast, lunch and dinner – with a different flavour at every meal. It’s a great way to get your five-a-day and to use up veggies. 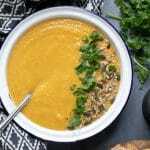 Some of my favourite soup recipes are Kale Soup, Vegan Laksa, Mexican Bean Soup, Beetroot Soup and Vegan Lentil Soup. All those lovely veggies turned into a tasty bowl of nourishing goodness. What’s not to love? 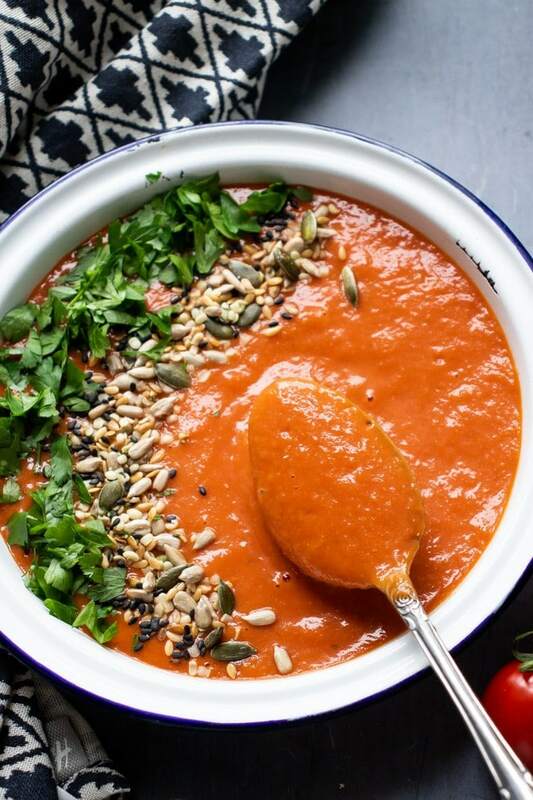 To make this delicious vegan tomato soup recipe, you only need 6 simple ingredients! Thanks for checking out my creamy tomato soup recipe! I love hearing from my readers. 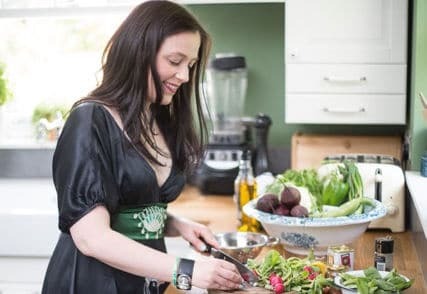 You all allow me to do what I love and write this UK food blog, sharing vegetarian recipes, vegan recipes, vegetable cake recipes, vegan cake and also easy vegan desserts. This delicious easy tomato soup recipe only takes 20 minutes to make and 6 simple ingredients. It's full of flavour, creamy and is vegetarian, vegan and gluten free. Heat the oil in a large pot over a medium heat. Add the onion and cook for 4 minutes until softened. Sprinkle in the flour and stir well. Add the tomatoes, stock and tomato puree, stir well then bring to the boil. Reduce the heat and simmer for 10 minutes. 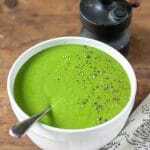 Puree with a hand held blender or food processor. Add more water to thin, if desired. Ladle the soup into bowls and serve. If desired, top with fresh herbs and seeds. You can substitute the fresh tomatoes for 2 x 400g/15oz cans of plum tomatoes, including the juice from the can and chopping them up a bit in the pan. Look for low salt stock for serving kids. 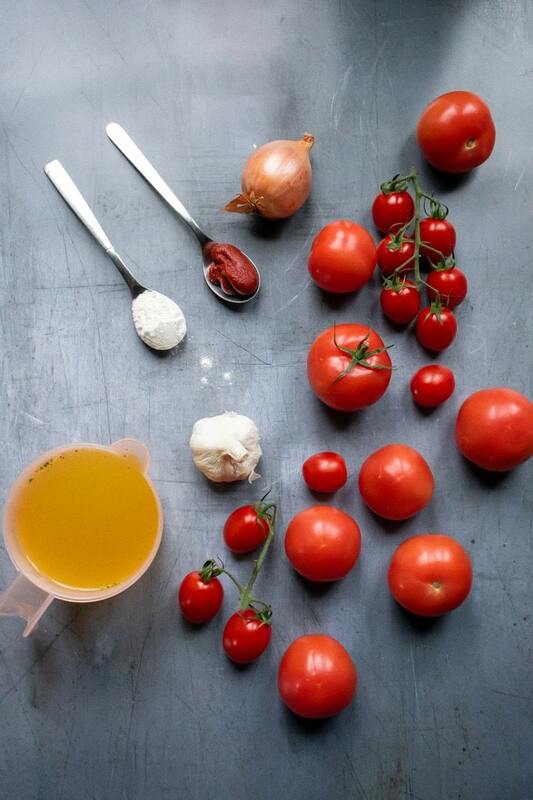 You don't need to skin or peel the tomatoes for this tomato soup. It all gets liquidised with the blender. This is infinitely better than the canned soup! Love it. My new favorite soup! There is nothing better than a good tomato soup with some crusty bread. I used canned plum tomatoes and it worked perfectly. This tomato soup was so rich and creamy! I didn’t garnish it with herbs and seeds, but I will next time! Mmm, this homemade tomato soup is the BEST! So easy. Always a lover of Soup and this soup was so yum. The color is so bright and the flavors were amazing. I used have fresh and a tin of chopped tomatoes. I’m a big fan of soups too..especially this time of year. Love how simple this sounds and can’t wait to try it.